May 19: What's Jen Clicking on Between Newscasts? Seven Questions with Elita Loresca for LAist, and something I bet you don't know about Today in LA's weather forecaster. Another rapper shot dead in broad Los Angeles daylight -- believe me I did my share of surfing to find out more about up-and-comer Dolla as I followed details of his shooting at the Beverly Center yesterday afternoon. 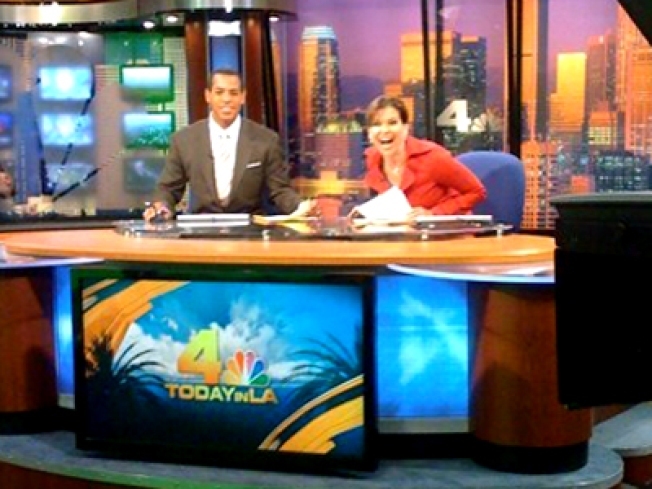 It wasn't until this morning I saw a story on something dear to my heart, our Today in LA weathercaster Elita Loresca. So Dolla will have to wait...but do listen to some of his work on his MySpace page, the most interesting thing I found on him. Check out this feature in LAist on Elita ... it also gives me the opportunity to pull up this picture of her from last year's KFRG Holiday food drive. As our ambassador of goodwill to the Inland Empire, she delivered our Today in LA staff food donations to save us all the trip out there last fall -- I believe we were afraid of awful traffic because this was all amid one of the big fires we were covering, and as you can see, Elita scored herself a ride in a San Bernardino County Fire Truck. 5) You have admitted on the air that you are not a Laker fan. You grew up here, why not the Lakers? Who is your favorite team? When I was growing up, I was a huge Lakers fan. I loved the old Lakers. I loved Magic Johnson, A.C. Green and Byron Scott. They played for the love of the game, not for how much money you were putting in their pocket. As I got older, I guess I lost my taste for the Lakers and basketball in general. My parents are still huge Lakers fans though. When I met my fiancé he pulled me back into watching basketball but not as a Lakers fan, actually as a Detroit Pistons fan. I know, they didn't do so well this year, but I like their style of play. I like watching Tayshawn Prince. I was bummed to see Chauncey Billups get traded because he was such a great leader and a great player. The Pistons' style of play is the kind I love to watch. I love the team game, not the style of play where it's just one guy putting up 60 points while his teammates just sit back and watch. You know what I mean. Your honesty on the air was refreshing.Was it difficult to admit to the viewers that you were not a Laker fan? It's hard because you want to make everybody happy, but at the same time I can't hide the fact that the Lakers aren't my team. Maybe now that my team is out of it, I can wish them luck. You always want your home team to win, but not when they're playing against your real team. I love it when Elita starts talking sports, especially basketball, because she's such a jock and it's a side of her I think our viewers would never get by just watching. She's no girly girl -- she played high school basketball and volleyball and was good at it. In fact, she started on both JV teams her freshman year at Chino High and was a Varsity basketball player her sophomore year. How do I know all this? I had a sort of a vague idea, and remembered she played point guard against Marion Jones at one point. So I asked her for some details today and she said, "I started as the point guard my Junior and Senior year... I can't recall the exact number of wins to losses, but there was definitely more wins than losses! "Best time on the basketball team was when my sister and I played together during my Junior and senior years. She was also a point guard, so we would interchange as point guard and #2 guard (shooting guard). I scored a few points and could bring down a few rebounds a game, but defense is where I excelled and I could pass! I was the assist girl! As the point guard, I had to see and command the "floor" (court). I had to know how to run the offense inside and out. I made sure my "tall" girls got the ball inside and my 3-point shooters got the ball out on the perimeter. "While on defense, I was the "help" inside the paint. My role on the team wasn't to be the leading scorer or rebounder... but to place the ball in the right players' hands and to play solid defense. My best games were limiting their best player to single digit points and running a solid offense that gave us more points than the other team." Today's a special election day also, and I've been cramming a little bit on the California State ballot propositions as I get ready to fight through the crowd of 0.023 people at the polls to vote today. Seriously, though; I had coffee with our political reporter Conan Nolan this morning and I'll share some of his insights with you on a video version of this column (it's taking forever to upload, or else I'd include it here) later. (I'm counting on web editor Jon Lloyd to post that for me while I'm on the air with the midday report later on this morning. Editor's Note: Which I did. Extremely Low Editor's Note: I may be tucked away down here, but all the better to horde these monitors... wha ha ha ha.